Alberta Premier Rachel Notley says the Trans Mountain pipeline expansion should be back on track if a National Energy Board report due later this month "goes our way." Last summer, the Federal Court of Appeal quashed the project's approval, bringing construction to a halt. The court ordered the NEB to undertake additional consultation on the impact of tanker traffic on the marine environment off the coast of B.C. The report is due on Feb. 22. 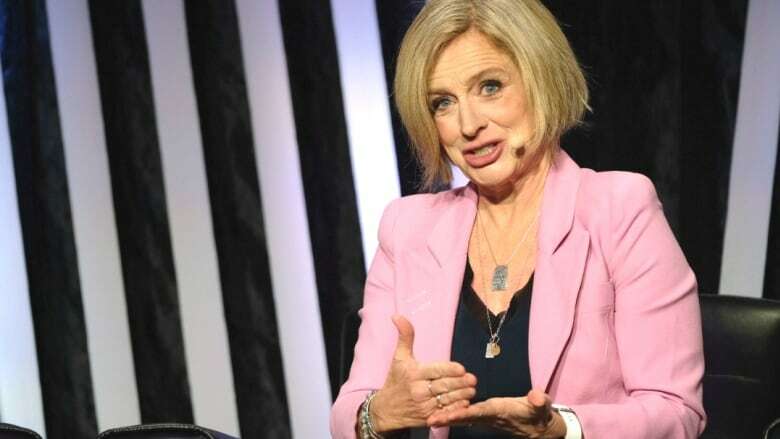 "I don't think it's going to be in the courts for years," Notley told Rosemary Barton, co-host of The National, before an audience of about 300 at a discussion on the future of Alberta's energy sector in Edmonton on Tuesday. "I do think we're going to get the approval back in play. I think we're going to get shovels in the ground later this year." If the NEB decision "goes our way," Notley said, "I think we're back on track." Marine safety is one piece of the TMX puzzle. The federal government was also ordered in the same court ruling to do additional consultation with Indigenous people. On Tuesday, Notley said the province was close to concluding a deal to buy rail cars. "We'll be able to talk to Albertans about that very soon," she said. WATCH | Alberta Premier Rachel Notley on the case for pipelines. The premier said a pipeline is the safest option to move oil. But she said the inability of successive federal governments to build a pipeline to the coast has put Alberta in a position where it had to curtail production to restore oil prices. "That is an unsustainable situation," she said. "It's a non-economic situation. It has consequences."